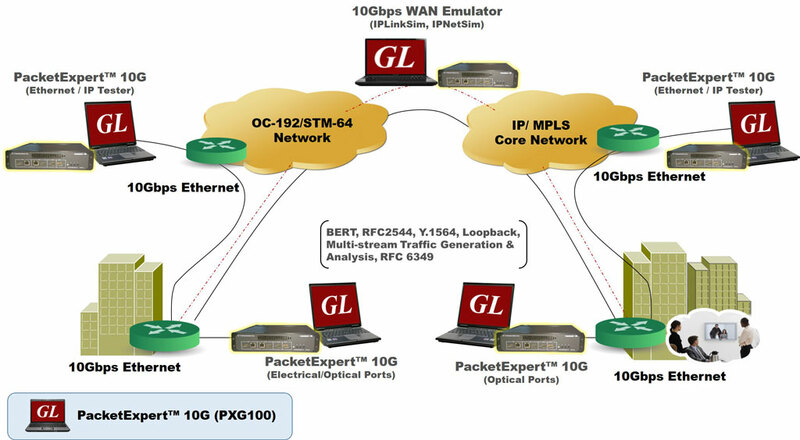 GL’s PacketExpert™ 10G provides comprehensive testing of 10 Gbps wirespeed Ethernet/IP networks. It has two 10 Gbps Optical ports, and two 10/100/1000 Mbps Electrical/Optical ports capable of BERT, Smart Loopback, RFC 2544, ExpertSAM, Record and Playback, PacketBroker, Expert Analyzer, and ExpertTCP֭™ functionalities. Each GigE port provides independent Ethernet/VLAN/MPLS/IP/UDP layer-wise testing at wirespeed. BERT is implemented for all layers. RFC 2544 is applicable for Layers 2, 2.5, and 3, and Loopback is applicable for Layers 2, 3, and 4. GL also offers Touchscreen Handheld PacketExpert™ 10G version of 10G Ethernet/IP Tester (PXG101), with a Tablet PC mounted on PacketExpert™ 10G, which makes this tester suitable for field testing. With the capability to generate/receive traffic with stacked VLAN (Q-in-Q) and stacked MPLS, PacketExpert™ 10G finds use in testing a wide range of networks – from testing individual links/switches, testing local Ethernet/IP networks (LAN), end to end testing of Wide Area Networks (WAN), testing Core/MPLS networks, and much more. With additional licensing (CXG100) enable remote controlling of PacketExpert™ through multiple command-line based clients. Supported clients includes C#, TCL, and Python. The Command line Interface (CLI) feature allows the users to access all the aforementioned functionalities remotely via clients using MAPS™ CLI Server. PacketExpert 1G™ - quad port portable device with 1G electrical and optical ports. Wire-speed BERT, RFC 2544, RFC 2544 (single Port), Loopback, Record/Playback, ExpertSAM, and PacketBroker. BERT, RFC 2544 Testing over Framed Ethernet (Layer2), Stacked MPLS (Layer2.5), IP and UDP. BERT testing is also supported on Layer1. Capable of handling full wire speed BERT, in both directions, on both 10G Optical ports and 10/100/1000Mbps Electrical/Optical ports. Supports industry standards PRBS patterns 29-1, 211-1, 215-1, 220-1, 223-1, 229-1, and 231-1, constant patterns like all ones, all zeroes, alt ones-zeroes and user-defined test patterns ranging between 1 to 32 bits. Both smart loopback (auto layer detection) and selected user-defined layers loopback capabilities for incoming traffic. Real time graphical representation of the combined Throughput and Bit Error rate, plotted over time for BERT testing. Link (P1-P2/P2-P1) statistics and Port (P1, P2) statistics. The PacketExpert™ 10G Rack unit incorporates all the features of a single dual port PacketExpert™ 10G portable unit along with the necessary PC hardware with Windows® OS and remote accessibility via Ethernet Remote Desktop. 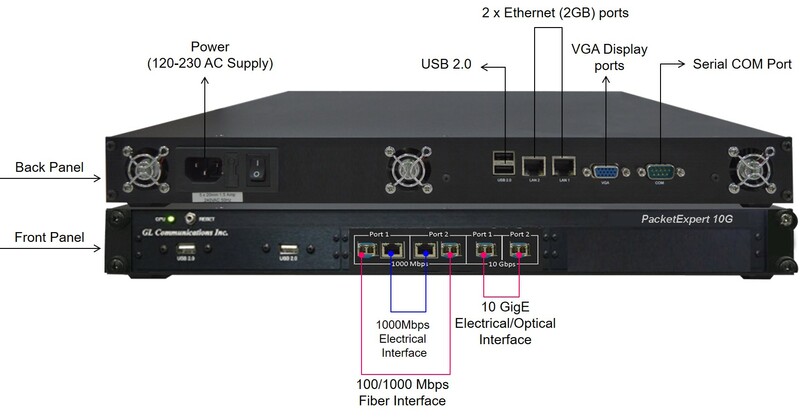 2-Port 10/100/1000Mbps Electrical/Optical and 2-Port 10G Optical PacketExpert™ w/Embedded Single Board Computer (SBC). This version of 10G Ethernet/IP Tester (PXG101), with a Tablet PC mounted on PacketExpert™ 10G, which makes this tester suitable for field testing. High Density PacketExpert™ 10G of 12/24 GigE ports form factor solution for testing GigE switches, routers and network conditions. This multi-device hardware unit incorporates all the features of a portable 10G PacketExpert™ unit along with the necessary PC hardware with Windows® OS and remote accessibility via Ethernet Remote Desktop. PacketExpert 10G 12-Port appliance w/ Embedded Single Board Computer (SBC). SBC Specs: Intel Atom CPU, 4GB RAM, Windows 7, MSATA SSD, 4 USB Ports. 19" 1U Rackmount Enclosure. (If options, then x 3). PacketExpert 10G 24-Port appliance w/ Embedded Single Board Computer (SBC). SBC Specs: Intel Atom CPU, 4GB RAM, Windows 7, MSATA SSD, 4 USB Ports. 19" 2U Rackmount Enclosure. (If options, then x 6). Refer to Packetexpert High Density 12/24-port Ethernet Tester for more details. In Layer1 testing, data is carried over Layer1 frames. Only the Preamble, SFD and Frame Check Sequence are present. Apart from these fields, the entire frame consists of the payload (BERT pattern). With the implementation of frame tagging, the Ethernet frames can be identified as belonging to a particular logical LAN. This allows different ports of a switch to be assigned to different logical LANs unlike traditional LANs. The 'tagging' feature evolved as VLANs allowing any user to be connected to any logical LAN, without having the requirements of physical presence in same premises. The VLANs simplifies security, manageability, and load sharing. The implementation is defined in 802.1q standard. A multi-tagged frame having multiple VLAN IDs, EtherTypes and other VLAN header bit fields constitute Q-in-Q frames, also referred to as VLAN stacking. This results in the tagged data frame to be tagged again with a VLAN tag, when it traverses the service provider network. The additional tag is removed at the edge of the service provider network before entering to destination network. GL’s PacketExpert™ is capable of doing Wire speed Ethernet testing over Ethernet/IP networks. Up to 3 stacked VLANs configuration. The sequence of insertion is such that VLAN#1 forms the innermost tag; followed by VLAN#2 and VLAN#3 forms the outermost tag. Flexibility is provided to the user to select the VLAN type field (0x8100, 0x88A8, 0x9100, 0x9200, 0x9300) for each level. PacketExpert™ allows verifying the VLAN implementation meets the QoS expectations. User can set the VLAN Priority field to various levels and conduct the BERT and RFC 2544 tests to verify QoS. Utilizing the stacked VLAN feature, along with VLAN priority setting and combining with BERT/RFC 2544 testing helps extend the Layer2 testing over carrier Ethernet networks. Performance – Controlling QoS characteristics like Packet Loss, Latency, and Bandwidth within defined limits. Both end to end testing from customer edge to customer edge as well as testing within the core MPLS network is important. PacketExpert™ does both. GL’s PacketExpert™ supports MPLS testing with MPLS related statistics like the Packet Counts per Stack position provided for detailed analysis. Up to 3 MPLS stacked labels - Multiple MPLS label stacks are particularly useful in testing MPLS VPN implementations and multiple MPLS providers, and MPLS tunnels. MPLS#1 is the innermost label, while the other two are inserted in the outer levels. Configuring the Label value, the CoS bits (also known as the EXP or experimental bits) and the TTL (Time-to-Live) for each label, in addition to selecting the number of MPLS labels. BERT and RFC 2544 test capabilities over MPLS Layer 2.5 – Supports sending MPLS enabled streams in its BERT and RFC 2544 tests and report various QoS characteristics like Bit Error Rate, Throughput, Frame Loss, and Latency. Layer3 configuration allows editing source and destination IP Addresses. In addition, users can configure various IP header fields like TOS, TTL, Protocol, Header Checksum, and Identification field. User can choose to allow hardware to calculate/verify checksum or provide a fixed value. IPv6 is also supported. Layer4 configuration requires source and destination UDP ports to be defined. User can choose to allow hardware to calculate/verify checksum or provide a fixed value. PacketExpert™ provides 2 types of Error Insertion – Bit Error Insertion and FCS (Frame Check Sequence) Error Insertion. Bit Error insertion allows inserting Bit Errors into the outgoing Tx traffic. FCS Error insertion allows sending frames with wrong FCS value. PacketExpert™ 10G supports Wire speed BERT (Bit Error Rate Testing) up to 10 Gbps simultaneously over Framed Ethernet (Layer2), Stacked VLAN (Q-in-Q), Stacked MPLS (Layer 2.5), IP and UDP. It can generate and receive various BER Traffic Patterns, including various PRBS patterns, Bit Error Insertion, and FCS Error Insertion. 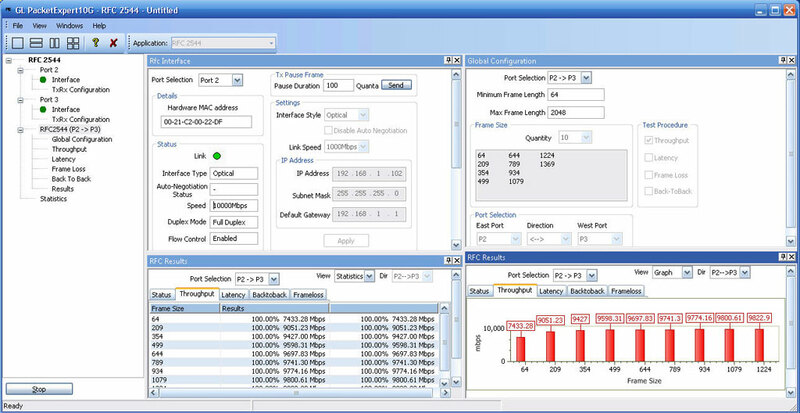 The screen below displays the PacketExpert™ 10G GUI, running All Port BER test on Port#1 and Port#2 10G optical ports. 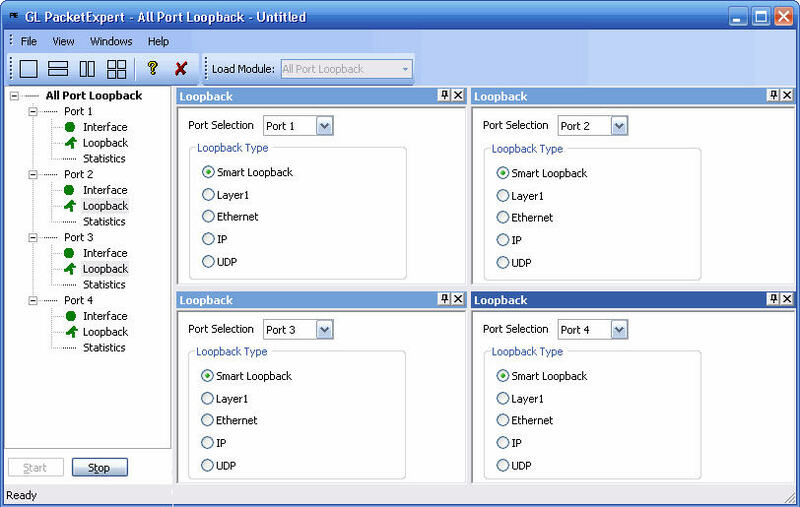 PacketExpert™ 10G supports Loopback capability on all ports. The loopback can be layer wise loopback as well as Smart Loopback. In Smart Loopback method PacketExpert™ 10G analyses incoming traffic, automatically detects and swaps the Source and Destination Addresses and sends back the traffic on the same port. PacketExpert™ 10G supports RFC 2544 tests up to 10 Gbps. RFC 2544 tests includes Ethernet Throughput, Latency, Frame Loss, and Back-to-Back performance tests in accordance with RFC 2544 specifications. The test is setup such that the traffic can be generated and transmitted on either of the ports and the looped back traffic from the DUT is received on the opposite port validating the test parameters. Record and Playback module is used to transmit and / or capture network traffic at wirespeed. Record and Playback feature is available in various operating modes such as Record Only mode, Playback Only mode. Wirespeed Record application supports capturing traffic on both the 1G and 10G ports at full line rate simultaneously (10 Gbps * 2/1 Gbps *2), without disturbing the link. Internal 8GB of DDR3 memory allows capturing up to 8GB of traffic (from both ports) at full Wirespeed (10 Gbps/1 Gbps). The captured traffic can be transferred to the host PC for offline analysis. Capture formats supported are PCAP, NGPCAP (popular wireshark formats), DAT (GL proprietary Raw format), HDL (GL proprietary PacketScan™ format). Continuous capture can be achieved with "Wirespeed filters" to filter out traffic-of-interest, and continuously record to file on the hard disk. Up to 32 filters (16 per port) can be defined. Wirespeed Playback allows playback of canned traffic files (in PCAP/NGPCAP/DAT/HDL formats) over one/both ports at full 10 Gbps rate, allowing real world conditions to be recreated in lab. PacketExpert™ - ExpertSAM™ module is a single test conducted to validate service-level agreements (SLAs) as per ITU-T Y.1564 standard. ExpertSAM™ is intended for multiservice testing to measure the maximum performance of the DUT or the Network under test. In particular, it is aimed at solving the limitations of RFC 2544 test. 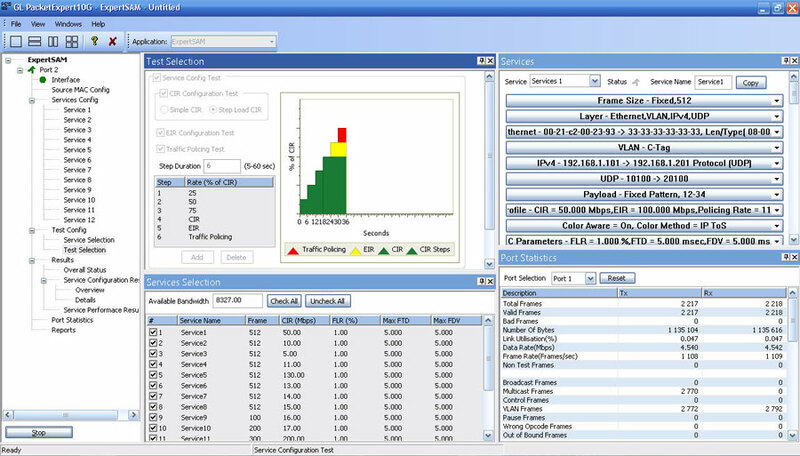 ExpertSAM™ defines a methodology to test Ethernet-based services to carry a variety of traffic. The application is used to validate Ethernet Service Level Agreements (SLAs) as per ITU-T Y.1564 standard. It supports the two key Y.1564 subtests, the Service Configuration Test (SCT) and the Service Performance Test (SPT). 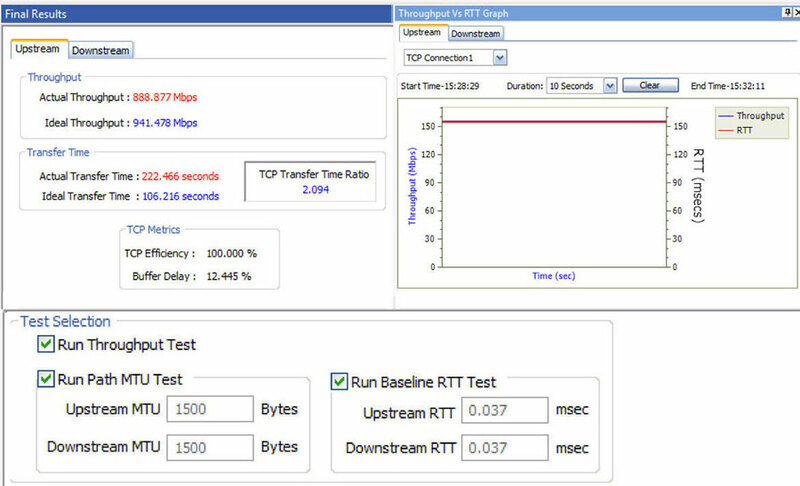 SLA parameters measured include the Throughput, Frame Transfer Delay (FTD), Frame Delay Variations (FDV), and Frame Loss Ratio (FLR) service acceptance criteria to validate the network path under test. Up to 16 streams can be tested with full Wirespeed (10 Gbps/1 Gbps). 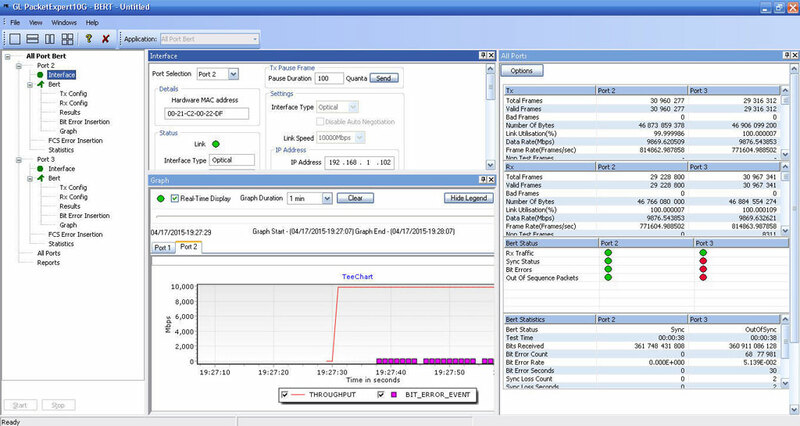 PacketBroker is another optional application supported on GL’s PacketExpert™ 10G that allows the test tool to be used as a highly precise non-intrusive Wirespeed Ethernet Tap with all the necessary features such Pass through Tap, Hardware Filtering, Packet Modification and Output aggregation. 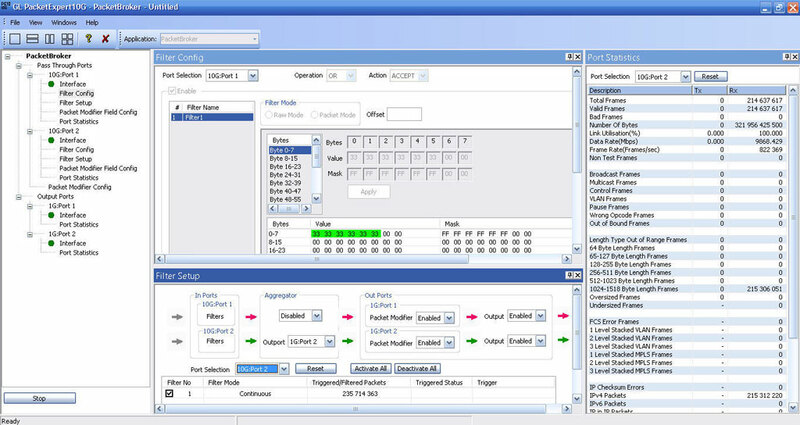 Up to 32 Wirespeed filters on each port (16 per port) allows to capture traffic of interest, modify the captured packet to insert useful information such as nanosecond precision timestamp, Port number etc., and forward the modified packets on the output port to be analyzed using packet analysis applications like GL’s PacketScan™. PacketExpert™ 10G operation is bi-directional, which means that both transmission directions are simultaneously processed by the equipment. Multi Stream UDP/TCP Traffic Generator and Analyzer (PXG108) is a hardware based Ethernet tester capable of generating multi-stream Ethernet traffic of varying packet length and also analyze the loopback traffic. This tool finds itself especially useful for end-to-end testing of 1 Gbps and 10 Gbps WAN (Wide Area Network) links. 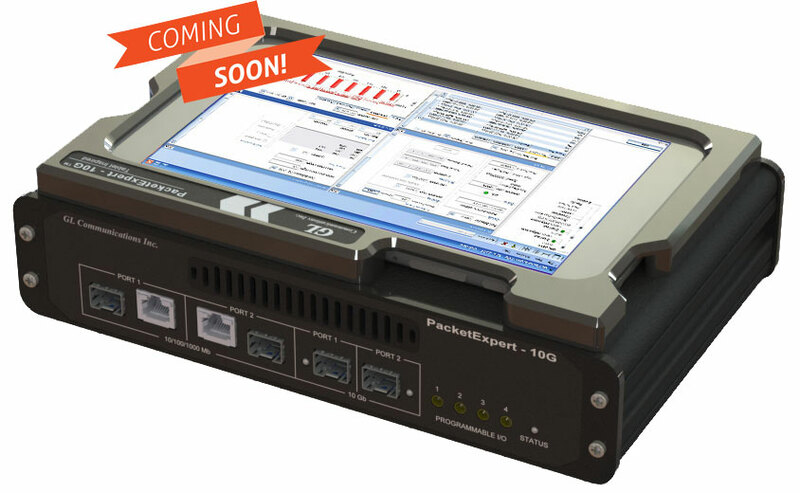 It is currently available on GL’s powerful test platform - PacketExpert 10G™, that sports dual 10 Gbps optical and dual 1 Gbps optical/electrical ports. As depicted in the network diagram above, the generated streams can be defined according to the intended application type such as Data - HTTP, FTP, ARP, ICMP and many more, VoIP - RTP streams (over UDP) carrying Voice codec payload like G711, G729, AMR etc., and Video - RTP streams (over UDP) with H264 codec. The test results include Frame Loss, Frame Delay and Frame Delay Variation metrics for each stream. Easily monitor the bandwidth performance using live throughput consolidated graphical view for all the streams (16 streams over 1G/ 10G ports). The Port#2 on PacketExpert 10G™ offers Smart Loopback functionality on both 10G/1G to loopback the incoming traffic back to the source in the network. Loopback option helps in easy test setup, especially in end-to-end testing, when the other end is in a remote place. In such cases, one PacketExpert™ 10G can be put in constant Loopback at the remote end, and tests can be controlled at the local end. 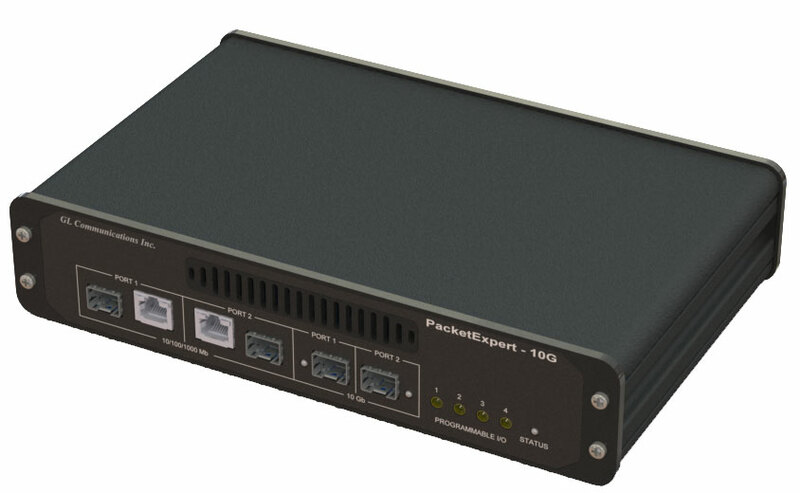 ExpertTCP™ is an optional application with GL's PacketExpert™ 10G, a dual port tester for 10 Gbps/1 Gbps Ethernet/IP Networks. It supports RFC 6349 based TCP Throughput test methodology. GL's ExpertTCP™ performs bi-directional TCP throughput measurements in combination with another unit at the remote location (other end of the network), that acts as the TCP server. ExpertTCP™ supports both Upstream (Client → Server) and Downstream (Server → Client) direction testing. Simultaneous bi-directional testing/unidirectional testing can be performed. Up to 8 TCP connections are supported on 1G platform, whereas up to 16 TCP connections are supported on 10G platform. Results are reported for both directions. The server at the remote location is completely controlled by the client side (located locally). User configures both client and server locally, and the results are displayed locally, avoiding the hassles of configuring the test at multiple locations. 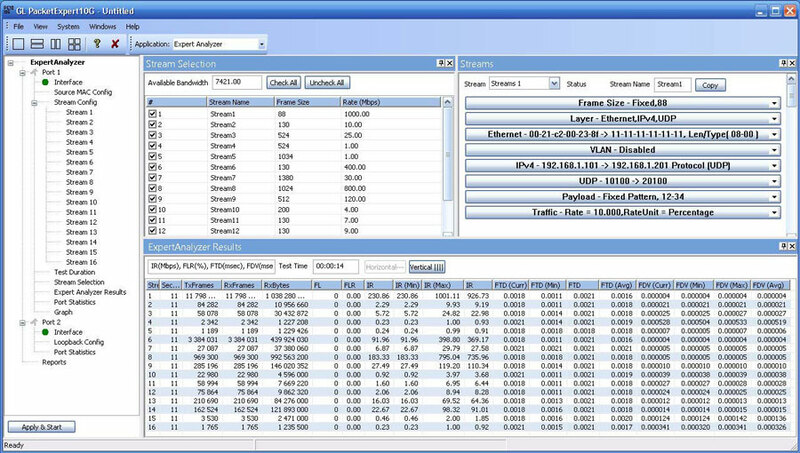 PacketExpert™ 10G includes report generation option to generate consolidated reports in CSV and PDF file formats. 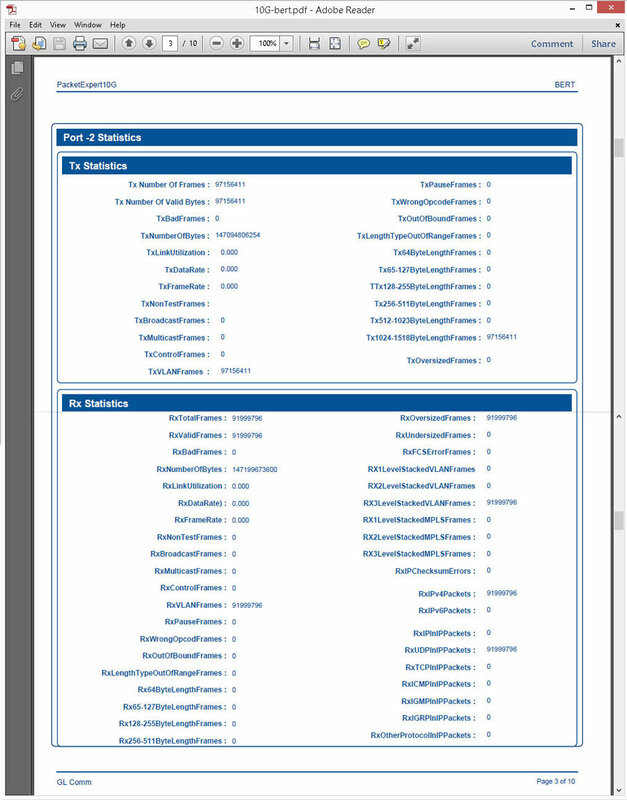 The following sample CSV and PDF reports generated for ‘All Ports BERT' test includes Interface, BERT Statistics, Tx/Rx Statistics, Tx/Rx Configuration details for each of the 10G ports.